Most are able to juggle the multiple demands of school, sports, work, chores, and family life. However, gaming becomes an addiction when it starts to interfere with a person’s relationships or their pursuit of other goals. This might be maintaining healthy relationships, achieving good grades, performing well at work, or being a contributing member of a group such as a sports team. Computer and video games, especially the massively multiplayer online role-playing games (or MMORPGs) such as “World of Warcraft,” allow players to behave very differently from their normal persona. A shy child can suddenly become gregarious; a passive child can become aggressive. Titles such as “Grand Theft Auto V” and “Fortnite” have enjoyed immense global popularity due to their compelling gaming mechanics and inbuilt online capabilities that allow gamers to play alongside others from across the world. They can be a fun outlet for adults and adolescents alike, but for some, the pull of gaming becomes a more consuming habit. Young people, who often feel powerless in their daily lives, suddenly have the ability to command armies, drive (and crash) cars, and wreak havoc on a virtual world with no real-life consequences. This is seductive! And when that boy or girl is already finding it a challenge in the “real world” to make friends, computer and video games offer a way to interact with others in their “virtual world,” without the distress of face-to-face interactions. Gaming addiction is a relatively new area of research that the medical community is only just beginning to catch up with. Crucially, however, evidence now points to gaming disorder as a true behavioral addiction. It has also been found that compulsive use of video games is linked to symptoms of other recognized disorders such as depression, anxiety, and ADHD. For this reason, it’s important for the family and loved ones of affected individuals to understand that breaking any addiction is not an easy feat. Compassion, patience, and professional help are often required to resolve the issue effectively. Firstly, gaming addiction appears to not only change patterns of activity in the brain, but it may also contribute to structural changes in certain brain regions (1). 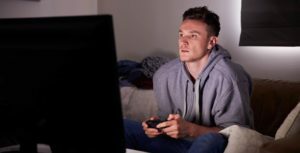 Changes in neural functioning can even lead to video game cravings that are similar in nature to those found in other addictions. These effects provide interesting insight into the way in which games can hook users. But it isn’t all bad news: gaming may actually be related to the development of brain regions linked to visual and motor skills. This will come as little consolation to those struggling with gaming addiction — but it underlines the importance of moderation and the need to avoid demonizing video games altogether. Interestingly, gaming addicts are also more likely than their peers to suffer from other mental disorders such as depression, anxiety, and ADHD (2). It remains unclear whether these disorders lead to gaming addiction, or gaming addiction itself causes their emergence. However, experts believe that gaming addiction and ADHD may effectively “reinforce” eachother — that is, one can worsen symptoms of the other and vice versa (3). For this reason, gaming addicts are likely to benefit from working with an experienced therapist with whom they can work through any wider issues that may exist. Video game and Internet addiction are not actual Diagnostic and Statistical Manual of Mental Disorders (DSM)-V classifications, although the American Medical Association is reviewing research in order to determine whether they should be included in the next update of the manual. However, the World Health Organization (WHO) has included video game addiction in its recent draft of the upcoming revision to its International Classification of Diseases (ICD-11). Many mental health professionals feel that video games are similar to gambling as an addictive process. The WHO, for instance, believes that approximately 3% of gamers meet the criteria for an actual gaming disorder. Estimates vary widely due to different approaches to diagnosis, with the most significant disparities stemming from whether researchers poll all gamers, including casual ones, or just frequent players. Nevertheless, the more all-encompassing definition of “gamers” used by the WHO implies that around 60 million people globally may be suffering from some form of gaming addiction (that is, 3% of 2 billion).